Welcome to the collaborative space for AERA Action Research Special Interest Group! This is our space for interaction. We want you to feel welcome and invite you to contribute. This is both a website and wiki. It is a website for all visitors, but it is a wiki-web for members (this means you can contribute). If you are not a member, please join us. Here is the link to join AERA Action Research SIG. If you are a member and the site has been shared with you, you will need to go to the bottom of the page and on the left side of the menu, you will see a login option. 2) learn how to use this site-- they are both short and watching these videos will help you become an expert. Once the site is shared with you, you can start the process by selecting members and adding your name and information to the contact list. If you want to see some of the places were action research is being done, take a look at the Action Research World Map. Derrel Fincher, our map keeper has created a google map with many of our sites. If you don't see your favorite center for action research listed, contact Derrel. It would be great to have the globe covered with markers. Also, you are welcome to use this site as a place to keep information about your action research activities. You are welcome to create your entry in the Action Research World. We have also have created a space for planning for AERA meetings. There is also now a Tech HELP! section to help you get started with two videos directly linked to this site. We have also added a sandbox for you to experiment with if you what to test our your wiki editing skills. Welcome and help us build and share in our action research world! Strategies, projects and virtuality • Possibilities for early childhood in a changing world • Research and evaluation changes in the models • Inclusion, quality, equity and social justice • Administration, infrastructure and connectivity • Internationalization: Modalities and access The Congress invites the academic community and the general public to participate in a profound and comprehensive discussion on the subject: Education, Innovation and Technologies: Teaching and Learning in the digital age. Proposals are accepted in English and Spanish. Information required to submit the proposal: • Name (s) of the author (s) of the work and the name of the presenter • Postal address, telephone, email • Institution, agency or organization that represents • Title of presentation • Summary of the work to be presented (5000 characters) • Format (individual presentation, panel discussion or poster) • Academic and professional presenter data • Endorsement of a teacher (if you are a student) Registration fee: US$50.00 (UPR students do not have to pay registration fee). Deadline to submit proposals:November 16, 2018. Go to http://congresoeducacion.uprrp.edu for more information or to submit your proposal. Brandeis University seeks a director for its Education Program. The Education Program is a small interdisciplinary unit which currently offers an Education Studies major, undergraduate and graduate teacher education programs and a graduate program in teacher leadership. Our faculty are actively involved in research on urban schooling, comparative education, teacher education/teacher learning, teacher leadership, experiential education, and the history and philosophy of Jewish education. Located 11 miles west of Boston, Brandeis is easily reached by both public and private transportation. Brandeis faculty enjoy living in a thriving metropolitan area rich with cultural and educational resources, including access to the libraries of adjacent universities. Brandeis is close enough to the New England country-side and coasts to allow for easy escape. The Harry S. Levitan Director of Education will serve on the Brandeis faculty at the rank of associate professor or professor either inside or outside of the tenure system. We are looking for a colleague who bridges the worlds of scholarship and practice and who shares our commitment to promoting social justice through education. Some of our programs and courses draw on faculty from around the university. Others depend on close partnerships with public and Jewish day schools in the area. We need a director who can develop strong intellectual and programmatic ties with colleagues and administrators at the university and in the field. We are also looking for a leader whose scholarly and teaching interests can complement those of our existing faculty and who can enrich and expand our offerings. Applicants should upload to https://academicjobsonline.org/ajo/jobs/11517 a cover letter, curriculum vitae, three letters of recommendation, and two writing samples that provide a window into the candidate’s intellectual world and educational vision. Please share this letter and the attached job description with colleagues. Our search is open until November 15th. Some of you are using an activity, video or resource from the tutorials in your syllabi or course links. So this is just a quick message to let you know that the Action Research Tutorials created by the Center for Collaborative Action Research has moved (and been revised) over the summer as the wikispaces location is no longer in operation and does not support forwarding links. The tutorials are as set of videos, activities, and resources to support the learning and teaching of action research. Also, we have added a facebook group to support interaction, and it would be great if you would join. Feel free to promote a project, book, or activity that the Action Research Community might want to know about. You might also be interested in our Action Research Community (ARC) of the Action Research Network of the Americas called of Supporting the Teaching of Action Research (STAR). In addition, we will have one more ECE Asst. Prof. tenure-track position, on our WWU, Bellingham, WA campus to begin Fall 2019. Persons interested in the WWU, Bellingham, WA position should contact me directly for more information. We strongly encourage inquiries now from members of groups who have been and still are underrepresented in university faculty positions. The formal position announcement will be available by Fall 2018. Early childhood inquiry-based pedagogy, early environments, play, and creativity. Consider submitting to this special issue, which is a mechanism to advance and capture the current conversation about computer science and engineering education in pre-collegiate schools—worldwide—by using current research studies in the area. Quantitative, qualitative, mixed-methods, and action research methodologies are welcome for this special issue. A clear problem and research questions, appropriate theoretical framework, literature review, methodology and methods, analysis, conclusions, and limitations are expected for all submitted articles. Recently extended: The deadline for manuscript submissions is in January 2019. The five of us, Michele Jacobsen, Sarah Elaine Eaton, Barb Brown, Marlon Simmons, Mairi McDermott, from the Werklund School of Education at the University of Calgary, are happy to share our recently published article about our action research in graduate education, “Action Research for Graduate Program Improvements: A Response to Curriculum Mapping and Review”. Abstract: There is a global trend toward improving programs and student experiences in higher education through curriculum review and mapping of degree programs. This paper describes an action research approach to program improvement for a course-based MEd degree. The driver for continual program improvement came from actions and recommendations that arose from an institutionally mandated, year-long, faculty-led curriculum review of professional graduate programs in education. Study findings reveal instructors’ perceptions about how they enacted the recommendations for program improvement, including (1) developing a visual conceptualization of the program; (2) improved connections between the courses; (3) articulation of coherence in goals and expectations for students and instructors; (4) an increased focus on action research; (5) increased ethics support and scaffolding for students; and (6) the fostering of communities of practice. Study findings highlight strengths of the current program and course designs, action items, and research needed for continual program improvement. We have launched the Action Research SIG Newsletter and are currently accepting newsletter items. As a way to stay connected, to keep learning about what happens in our professional lives and various communities of practice engaged in action research (AR), and to create new knowledge flows and participation as members of our community, we welcome you sharing AR past, current, or present research projects, announcements, resources, publications, opportunities to network and to collaborate, and/or other. Please visit this link, http://bit.ly/AR-news, to submit your action research-related items! The editors of the Handbook of Research in Middle Level Education are excited to announce a call for chapters for a new handbook, Curriculum, Instruction, and Assessment: Intersecting New Needs and New Approaches, edited by Sandra Stacki, Micki Caskey, and Steve Mertens. Proposals for chapters are due by June 15, 2018. Authors will be notified of acceptance by July 15 and final manuscripts are due October 15. If you have any questions about this volume, please contact the lead editor, Dr. Sandi Stacki (Sandra.L.Stacki@hofstra.edu). The Northeastern Educational Research Association has shared a call for proposals for their 49th Annual Conference (10/17 - 10/19/2018). This is an excellent conference for those that are interested in another opportunity outside of AERA to present their research or participate in professional development with approximately 400 attendees. NERA membership is split fairly evenly among faculty/teachers/professionals and graduate students. Below is a link to the call for proposals. Thank you to our past Chair - Craig Mertler, Program Chair - Elena Polush, and honorary team member - Linnea Rademaker! Please visit the "2018 ANNUAL MEETING" page to see information on our sessions at AERA 2018, along with information about the Business Meeting in New York City! The AERA General Election is approaching soon. All members of the Action Research SIG have the opportunity to run for elected office and to hold an important Action Research SIG leadership position. New terms for officers begin at the close of the Action Research SIG Business Meeting during the AERA Annual Meeting in New York City in April, 2018. All self-nominees must hold active membership in the Action Research SIG. Within the document, include your name, title, and contact information at top of page in left-hand corner. This should be followed by a maximum 250-word statement (anything over the limit will be deleted before review) of the position that you are running for and why. Also, be sure to include any leadership experience that you have, particularly within AERA and/or the Action Research SIG, along with any additional information that might qualify you for the position. Please consider running for these important positions within our SIG. Participating in this capacity is a wonderful way to volunteer your service and to give back to your professional community. 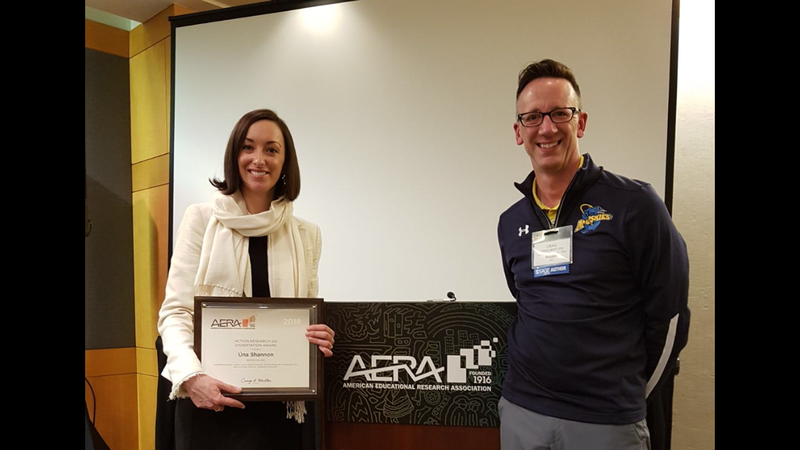 On behalf of the Officers of the Action Research SIG of AERA, we are happy to announce the competition for the 2018 Action Research SIG Dissertation Award. We welcome and encourage self-nominations for the award, based on the criteria and timelines presented below. Description of the Award: This award will be presented to a recent graduate student who submits a summary report of his/her action-research-based dissertation that meets the criteria below and best exemplifies the principles of action research and/or that advances best research practices. The dissertation has a distinct action research focus and method. The dissertation has action research design and methodological rigor. The results, interpretation, discussion, and/or implications are clear and in line with action research tradition. The dissertation includes implications and recommendations for continuing the action research cycle. There is a substantive contribution to local context and/or the field of action research. The overall quality of the dissertation writing and presentation is high. Please visit the "2017 Annual Meeting" page to see our 2017 Best Paper Award winners, and to download their action research paper! Thanks to our Sponsors! These organizations helped sponsor our business meeting at AERA, San Antonio. Click on each link for more information. For additional information about the 2017 Annual Meeting in San Antonio, please visit the "2017 Annual Meeting" page. A specific page for the 2017 Annual Meeting has been added to our site (see both the horizontal navigation bar and the sidebar or follow this link: 2017 Annual Meeting). Check back for information related to the 2017 Annual Meeting in San Antonio, Texas! I send a big hug and a special thanks to all Action Research SIG members who voted in our SIG elections this spring. I also want to thank you guys for providing me with the opportunity to serve as SIG chair over the past two years. I truly enjoyed serving this group. I will continue to be active in our SIG and in AERA and look forward to seeing you guys at the 2017 AERA Annual Meeting next year. Congratulations to our newest slate of elected Executive Board Members. These officers work to ensure our SIG's success. Subpages (18): 2019 Annual Meeting Action Research Books Action Research Syllabi Action Research World AERA Conference 2011 AERA Conference 2013 AR SIG History AR World Map Discussion Forums Job Postings Mapping our visitors Message archive Past Conferences Posts by Members Sandbox (for playing around) SIGs Links Tech HELP! What is Action Research?